You can now enjoy the pleasure, refinement and passion of espresso coffee in your own home. Enjoyed with friends, family or simply alone, Delta Q coffees will awaken your senses and surpass all your expectations. Delta Q brings a certain "je-ne-sais-quoi" to your life so you can enjoy a world where the passion for coffee takes pride of place and your satisfaction is the thing in mind. This is the Delta Q guarantee - providing the most original and authentic coffees. Find a very large selection of Delta's best coffee : coffee beans, ground coffees, ESE pods, teas capsules, Delta Q capsules, etc. Pack of DeltaQ Qonvivium capsules by Delta Cafés, 6 x 10 capsules. 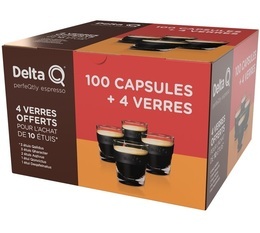 Pack of DeltaQ Epiq capsules by Delta Cafés, 6 x 10 capsules. Pack of DeltaQ Double Delta capsules by Delta Cafés, 6 x 10 capsules. Pack of DeltaQ BreaQfast capsules by Delta Cafés, 6 x 10 capsules. 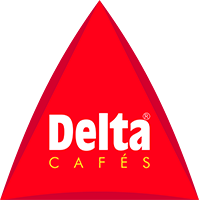 Pack of DeltaQ Cartagena capsules by Delta Cafés, 6 x 10 capsules. Pack of DeltaQ Abyssinia capsules by Delta Cafés, 6 x 10 capsules. Pack of DeltaQ Caribe capsules by Delta Cafés, 6 x 10 capsules. Pack of DeltaQ Malay capsules by Delta Cafés, 6 x 10 capsules. Pack of DeltaQ Red Rooibos capsules by Delta Cafés, 6 x 10 capsules. Balanced, pure origin coffee from Brazil, slightly acidic for this coffee roasted in Portugal by Delta Cafés. Packaging: 250 grams. Timor by Delta Cafés is a 100% Arabica ground coffee from Indonesia and certified as Fairtrade (Rainforest Alliance). Recommended in an espresso. This instant coffee comes in a 100g jar. Dissolved in hot water, you will quickly get a good cup of coffee without any fuss. A blend of Arabica & Robusta from famous Portuguese brand Delta Cafés.